You're about to order one of the simplest self-defense systems ever devised, and you can learn this system simply by watching it! 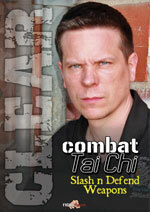 Stun your attacker in seconds! Quickly “clear” a weapon that is pointed at you… so you can take it away, and end the confrontation on your own terms. Learn an astonishing “full-body break” move that starts with a simple foot-hold and uses gravity to finish the job.